Tampa, who celebrated Sunday Mass first in the homes of Catholic families, and then in a small white frame church that stood not far from the site of the present Church. In 1927, Bishop Patrick Barry, of St. Augustine, established St. Martha as a parish and appointed its first resident Pastor, Father C. L. Elslander, who remained Pastor for 41 years until his retirement in 1968. Even then, Sarasota was the winter home of the circus, and time and time again these performers generously gave of their talents and skills to help the ever-growing parish. During his tenure as Pastor, Monsignor Elslander built the present Church, rectory and school, originally staffed by the Benedictine Sisters (San Antonio, Florida). 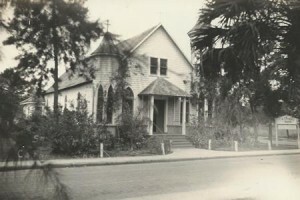 Contemporaneous with the establishment of St. Martha Parish was the establishment of St. Joseph’s Parish in Bradenton. For years these two parishes served all of the Catholics in Manatee and Sarasota Counties. Northern Boundaries: Easterly from Sarasota Bay along DeSoto Road to I-75 in the central part of the State. Eastern Boundaries: The Manatee-Hardee County Line southerly DeSoto Road to the imaginary extension of Hyde Park Street. Southern Boundaries: Easterly from Sarasota Bay along Hyde Park Street to I-75. Western Boundaries: Sarasota Bay northerly from Hyde Park Street to DeSoto Road and including Bird Key, St. Armand’s Key, Lido Key and City Island to New Pass. After years of meeting in one another’s homes when a priest from Sacred Heart Church in Tampa would come to say Mass forthem, the Catholics in Sarasota started, in 1912, to build a small frame mission church. The mission became St. Martha Parish in 1927 and was the only Catholic parish in Sarasota County until the mission in Venice became Epiphany Parish in 1958. By then St. Martha and Sarasota had grown to the extent that Incarnation and St. Michael the Archangel parishes were set up to the south and, in 1959, Our Lady Queen of Martyrs to the north. The full-sized, restored and gaily painted wagon wheels mounted on the wall behind the altar represent the close association between the Sarasota Circus community and St. Martha. In 1927, on October 1, St. Martha became a parish and, shortly after, the Ringling Circus arrived to set up its winter quarters in Sarasota. Father Charles L. Elslander, St. Martha first pastor, showed great concern for all the Circus personnel. Soon the parish outgrew its little mission church that faced Adelia Avenue. 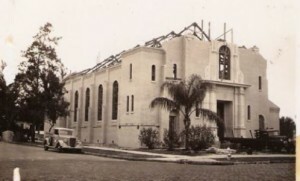 Plans were made to raise funds to build the present church facing Orange Avenue. The Circus offered to stage two performances each year on parish property for the benefit of the new church fund. From 1935 to 1941 Ringling put on shows in the area that today is the parking lot behind the church. With that great help from the Circus, work on the new church could start in 1940. The Official Circus Chaplain is listed among St. Martha priests. Every year, when the Circus is in the Tampa area, Father George “Jerry” Hogan comes to St. Martha for a Circus Mass and he meets here with clergy and religious who minister to Circus personnel when they are on the road. Father Jerry records at St. Martha the sacraments he administers when he is traveling with the Circus. The corpus was sculptured by a Ringling School of Art student who stored it in a Sarasota warehouse and never reclaimed it so it was donated to St. Martha. The original cross was fashioned by the church workmen. The stations were painted in oil on wood by noted painter Ben Stahl, at that time a former Sarasotan living in San Miguel, Mexico. He was the brother of parishioner Mae Meyer and a well known illustrator and eminent figure in the fine arts field. The stations were installed after the renovation of the 1970’s. This statue was designed by Rambusch Studios in New York City. 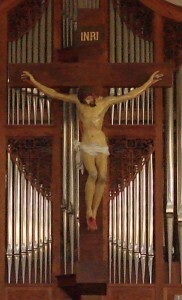 It was carved and finished by a northern Italian artist and was installed in 1972. 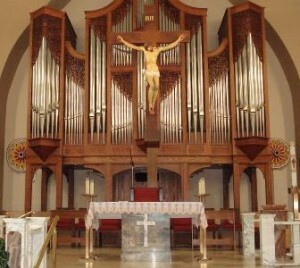 The red oak, two manual tracker pipe organ was built and installed in 1989 by long established J.W. Walker & Sons, Ltd. of Suffolk, England. It too well over a year to design and construct it. Florida in 1941.The windows have very fine detail with every piece of glass painted and fixed. They are included in the 1994 State of Florida Historical Stained Glass Survey conducted by the Stained Glass Association of America. The evangelists Matthew (lion) and Mark (angel) are portrayed in the Eucharist Chapel. Luke (bull) and John (eagle) are shown in the Baptistry. This painting has as its theme the faithfulness of the Church in celebrating the Eucharist from the Last Supper through the ages until the present day. Father Anthony Pastucci painted it circa 1988 while he was a parochial vicar at St. Martha. The shrine is located in the Northwest Courtyard wall corner. In 1980, the Very Reverend Jerome Carosella requested Patrick White, the owner of White Stained Glass Studios in Sarasota, to provide an original piece of art to recognize the growing number of Hispanic heritage parishioners joining the parish. 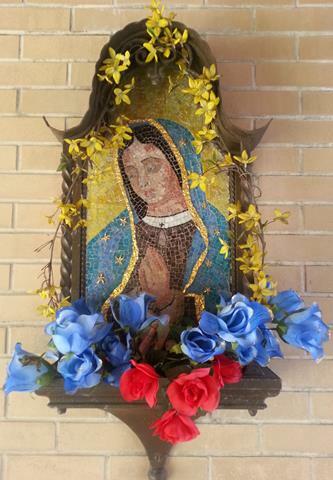 Our Lady of Guadalupe was chosen. She is the patroness of Mexico, and her feast is celebrated each year on December 12. The mosaic artist was Jack Cartlidge. He was a professor at the then Ringling School of Art and Design and a sculptor. The portrait is made from venetian glass mosaic tile imported from Italy. The shrine and frame is made from wrought iron fabricated by Kreissle Forge in Sarasota. Patrick White had a knack for selecting good artists and then challenging them to execute works in new media and to produce works of religious art. He was also responsible for the fabrication and installation of the stained glass window, designed by my sister, Kate White-Estep, in the rectory chapel. Mr. White’s stained glass studio also did repairs and restoration on the leaded stained glass windows in St. Martha Church prior to the installation of the exterior storm glass and present day hurricane storm shutters. Information obtained by Sean White, St. Martha parishioner. The painting in the Baptistry is the work of Tatiana McKinney who executed it in acrylic on linen with silver leaf embellishment. It was painted about 1986. Mrs. McKinney lives in Venice and teaches at the Venice Art Center and in North Carolina. Her painting of the Transfiguration hangs in the Catholic Center in Venice. “The Sacred Heart of Jesus” and “Our Lady of Grace” statues were acquired for the church through the efforts of St. Martha Altar Society a few years ago.